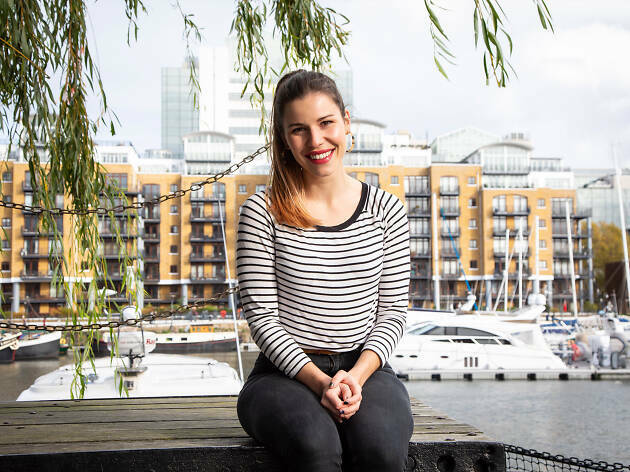 ‘I came to London from a small village in Brittany in 2011 as an au pair, and that’s when I discovered cupcakes. We had three bakeries in my village, but I had never seen the colourful cupcakes and tiered cakes that you find in London! I became obsessed with Hummingbird Bakery, and I bought their book so I could start making cupcakes for the kids I looked after. I realised I really, really liked baking – the decorating and the colourful things you could do with icing. It all started from there. After finishing as an au pair, I started my first office job. My colleagues all loved “The Great British Bake Off”, and one year, when it was on, we organised a competition for charity. I ended up winning, then I started making birthday cakes for people and started a blog. That’s when I began to take it much more seriously. Baking was already in my blood. I grew up on a dairy farm where everything was made from scratch. My mum is an amazing chef, and there are two restaurants in my family – we live around food, essentially. But coming to London, I met people from all over the world, from cultures that I’d never really come across. I live in Shadwell in east London, and I like that it’s so diverse and open-minded. It’s also so much easier to fly everywhere from London, so since I’ve been here, I’ve travelled much more. I’ve been to Japan, Denmark, Canada – and I take inspiration from the flavours of different cultures in my baking. It was my friends who encouraged me to enter “Bake Off”. It was the first show that I watched when I came to the UK, and I had little traditions around it with my best friend, who I live with. Every year, I’d always think: What would I do if I was in this baking challenge? So I filled in the long application form, then went through four months of auditions before, finally, I was selected! I’m a software project manager, and I was working at the same time as I was on the show, so it was quite challenging. In fact, I nearly called production to quit before filming started! Luckily, all my family and friends convinced me to do it, and being Star Baker the first week was such a boost. All the contestants had a WhatsApp group, and that was a huge support: they’re the only people who can relate to what’s going on. People don’t realise that we’ve spent four to five hours in a hot tent for each challenge, non-stop. One of the things “Bake Off” helped me to understand is the type of baking that I do. Before going on the show, I thought: I am so London – there is nothing French about me any more! But obviously, whenever I said anything about France, they put it in the show. The week after I left was Patisserie Week, and I was itching to jump in and make choux pastry. But the other bakers did so well, and it hasn’t stopped me from making patisserie or eating my favourite, a Paris-Brest. You can try Manon's recipes at www.manonlagreve.com.